It’s come to that point in your relationship where you’ve decided you no longer see a future with your partner. You’ve heard stories from friends, family members, even colleagues about their divorces/separations. How they were costly and time consuming. How both parties came out of the process feeling like they’d lost time, money, relationships – and yet still had to try to find a way to work together moving forward because they had children. Resentment, bitterness, anger are all emotions linked with the memory of break-ups. Surely, you think, there must be another way. An alternative to fighting. To Court. To Acrimony. A way that enables both you and your partner to move forward from the relationship positively, preserving your parenting relationship and allowing you to co-parent into the future. To make joint decisions for the benefit of your children. To put the needs of your family first, as opposed to having a stranger deciding what they believe is right for you. There is an alternative: It’s called mediation. Mediation is a confidential and voluntary process. It enables people to have discussions in a safe, impartial environment, allowing them to road-test ideas to find the best solution for them and their families. 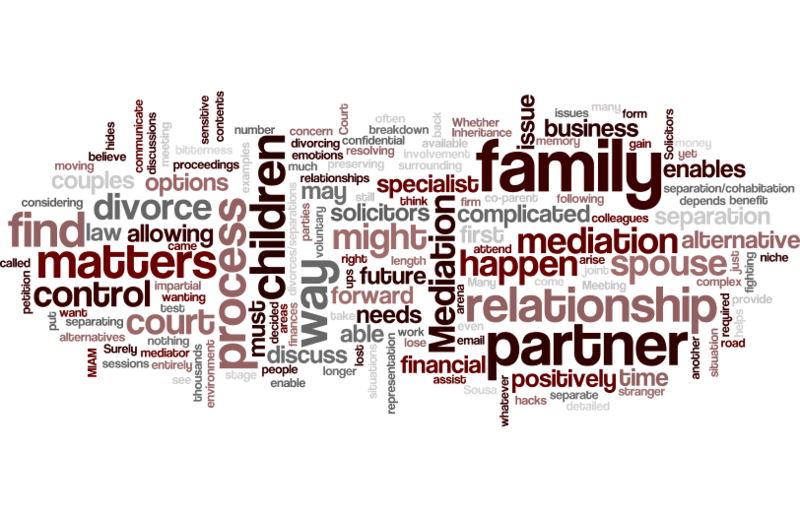 Mediation can be utilised at any stage of the process – whether you’re considering separating and want to discuss the contents of the divorce petition with your spouse, or whether you’re engrained in court proceedings and want to find a way to communicate with your partner constructively, and take back control of what will happen to your finances; mediation helps thousands of couples to separate positively. Before you can issue an application with the court for financial or children matters, you must first attend a Mediation, Information and Assessment Meeting (MIAM). At this meeting, a mediator will discuss with you the options available for resolving matters outside of the court arena. These options are cost-effective alternatives which enable you and your partner to be in control of the outcome of your separation. Many topics can be discussed including divorce, financial matters, children and matters surrounding separation and cohabitation. It is your process, so the length and number of sessions required depends entirely on your needs. There is nothing to lose from attempting mediation, and potentially so much to gain. So why not give it a go – what have you got to lose?